"We're giving away Assassin's Creed Chronicles: China on PC to celebrate Chinese New Year"
It's time to declare war on expensive game bundles, as Fanatical's latest 'Spotlight On...' collection brings you a quartet loaded with fantasy and classic turn-based battles! For just $1, the Elven Legacy Complete Bundle brings you the original 2009-released title from 1C: Ino-Co and Paradox Interactive combined with three vast expansions. The human race has driven the orcs from their land, but after 100 years, the orcs are planning to recapture what is theirs by any means necessary - war is coming! But the orcs are not the only race preparing to fight the humans as the elves, dwarves, and the undead are also in the mix. Playing as either the orcs or elves, you must lead your army into turn-based RPG combat and embark on a quest to track down a deadly human sorcerer who wields magic that could potentially destroy the world. Move your troops across hexagonal lands to capture settlements and gain the upper hand on opposing factions close by. Described by critics as "even more captivating than its predecessor [Fantasy Wars]", Elven Legacy invites you into a world filled with ancient powers, mythical beasts and hours upon hours of strategic warfare for both single-player and online multiplayer gameplay. And if that wasn't enough, the Elven Legacy expansions will give tons of additional features. Across the Elven Legacy: Ranger, Elven Legacy: Siege and Elven Legacy: Magic DLC expansions, players will gain access to over 35 new missions and dozens of new spells and heroes - as well as new artifacts, armies, bonus missions and more glorious large-scale battles! With a total saving of 91%, there's never been a better time to pick up the Elven Legacy Complete Bundle. It's time to design your own castle and engage in medieval warfare with a selection of popular simulation strategy Steam games in the Stronghold Bundle - Fanatical's latest 'Something for the Weekend' collection. Build your fortress from the ground up (quite literally), embark on dangerous skirmishes and defend yourself against invading armies with this base-building foursome. Take on the original best-selling castle sim, Stronghold HD, and test your mettle against renegade lords while building a castle fit to stand the test of time... and arrows. Once you've conquered these lands and learned the ropes, jump into its 'Overwhelmingly Positive' Steam rated sequel in Stronghold Crusader HD - filled with historical battles, castle sieges and hours of warfare between AI and friends in online multiplayer. Things take a dark and mysterious turn in Stronghold Legends: Steam Edition, where players must experience fantasy remaster of the mythical castle sim genre. Catapult werewolves over castle walls, incinerate troops with dragon fire and command the Knights of the Round Table in your quest for victory! Take your castle-building skills to a new level in Stronghold 2: Steam Edition, featuring stunning graphics and up to 8-players online game modes including Kingmaker and Deathmatch. Entertain your subjects or rule with an iron fist, dispensing medieval justice to overworked and malnourished peasants. Whether it's base-building, tactical warfare or good old fashioned strategy that you're after - the Stronghold Bundle delivers on all of these features and so much more! It's the best kind of piracy when it comes to this bundle! 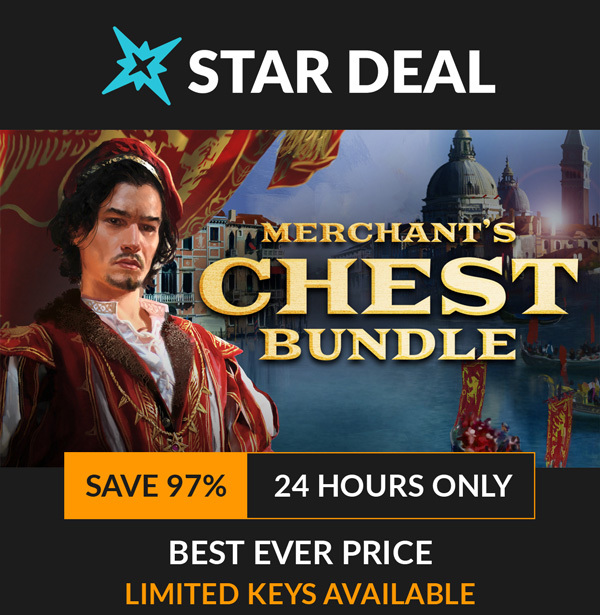 Set sail around some of the most exotic locations on the planet with the help of the Merchant's Chest Bundle - now at the BEST EVER price for 24 hours or while stocks last! Exploration and many a trade deal await in this selection of best-ever savings on classic simulation games that will take you across the seven seas in search of fame, fortune, and good old-fashioned sea battles. This bundle includes Port Royale III, Rise of Venice, and Patrician III and IV - as well as additional DLC content. Discover the beautiful yet rugged world of single-player puzzle adventure RiME - now at the BEST EVER price for 24 hours or while stocks last! 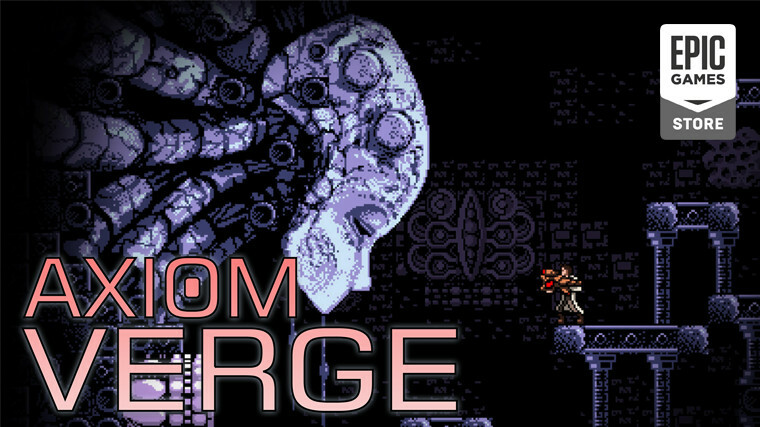 With this Steam key, players control a young boy who has awakened on a mysterious island after a torrential storm. Witness wild animals wandering around the island as you venture deeper into long-forgotten ruins and a massive tower that beckons you to come closer. Armed with your wits and a will to overcome, and the guidance of a helpful fox, players must explore the enigmatic island, reach the tower's peak, and unlock its closely guarded secrets. Wander across this mysterious island at your own pace and interact with wildlife, search for hidden items or simply take in the sights and sounds of Tequila Works' creative world, inspired by the Mediterranean. 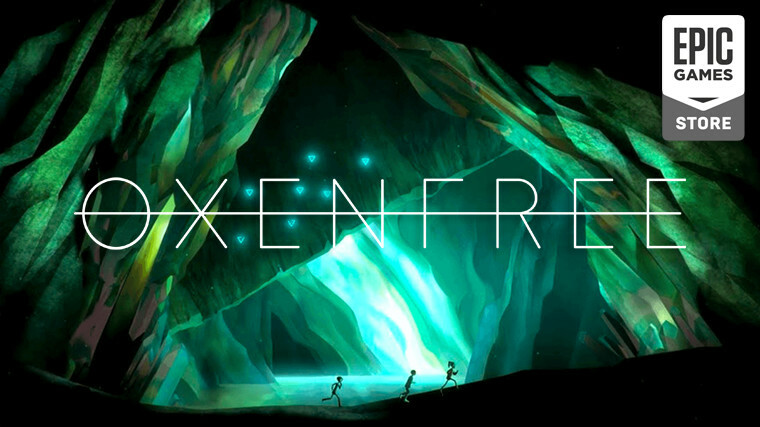 Make your way through the ancient ruins and its hidden marvels by solving puzzles with sound, light and shadow - use projection, perspective, platforming, and even time manipulation to progress. Dive deeper into the young boy’s backstory by uncovering dozens of secrets and collectibles on your travels. 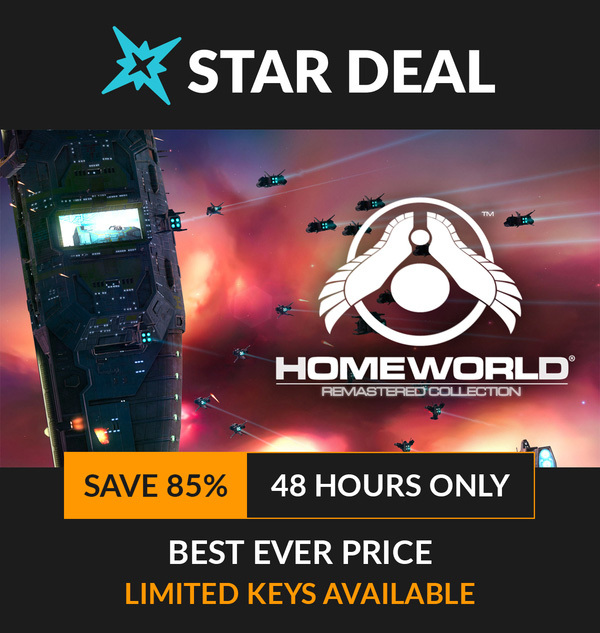 Blast off with an epic space strategy duo that redefined the RTS genre with the Homeworld Remastered Collection - now at the BEST EVER price for 48 hours or while stocks last! With this Steam key, players will control a fleet and build an armada across a vast array of single-player missions in two huge sci-fi strategy titles, as well as bonus archival versions of Homeworld Classic and Homeworld 2 classic in their purest, original release form for modern computers. Choose your unit types, fleet formations and flight tactics to ensure that your crew and spaceships are prepared for each and every strategic situation. Utilize advanced research to construct more than 100 ships ranging from light fighters to huge carriers. Take the battle online with competitive multiplayer modes as Homeworld and Homeworld 2 combine into one centralized mode - allowing up to eight players to use races, maps, game modes, improvements, features and technology from both games for unlimited engaging space battles on a grand scale. Enjoy the painstakingly re-mastered work from key members of the original Homeworld development team as the classic sci-fi strategy returns for a new generation (and old) to enjoy. Taking critical influence and assistance from the passionate fan community, the Homeworld Remastered Collection reintroduces Relic's acclaimed space strategy games using the newest sophisticated graphics rendering technology, as well as a fully remastered score and new, high fidelity voice recordings by the original actors. Homeworld has had a facelift, enjoy updated high-res textures and models, new graphical effects, new audio mix using original source effects and music - as well as Mod support and mod tools, and support for HD, UHD, and 4K resolutions.